If you are looking the way to attract your client’s attention? Then this A 4 size free flyer poster mockup will help you to add your design work in real environment. 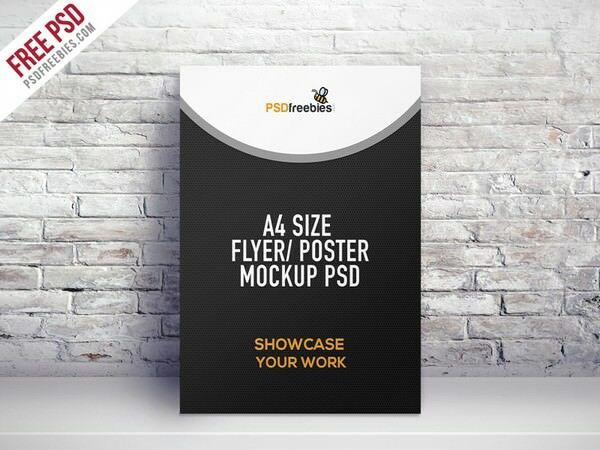 This Mockup template feature in front of wall texture to help you showcase your Flyer or Poster artwork with simplicity. The PSDs come fully-equipped with smart objects for easily editing the mockup as well. You need only place your Poster design you were working on and see its realistic version of it. Do you think your work needs some final finishing touches? If yes, this is right template to get job done. Even if they would like to add some more information on the poster, make it now before it is too late.You can add your design is very easy, you just need to open the PSD, double click smart object layer, add your design and save.